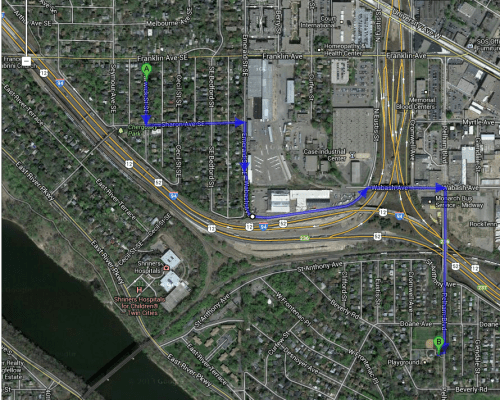 David Levinson lives just three blocks from St. Paul, Minnesota, but he almost never walks there. Standing in his way is a largely impassible highway and a series of sidewalk-deficient, glass-strewn streets. Normally we drive (it might be a stop on part of a longer shopping trip, and is a good place for the kids to get their “yahs” out), but on one of the few pleasant weekend days of 2013, we walked. We used this route. It was filled with broken glass, uneven railroad tracks, and lack of sidewalks. It’s somewhat industrial, so its lack of aesthetics was not surprising, but it is hard to see the nature of the unwalkability from the car. The walk will not be repeated. The reason for using this path is that the next shortest alternative crossed the Mn280 on and off-ramps, which were highly undesirable to walk on. We walked back via East River Parkway, but the distance (1.3 miles) while seemingly not much different, is both 0.5 miles longer round trip, more complex, and hillier. Even East River Parkway does not have sidewalks on both sides of the road, though the grassy strip is ok in the late spring. Ideally there would be a pedestrian crossing of I-94 at Emerald or Bedford to St. Anthony Avenue, but I suspect pedestrian demand is too low to warrant such a crossing (certainly it would not be anyone’s highest priority). My conclusion from this is that (1) St. Paul hates Minneapolis and does not want any inter-municipal pedestrian travel, and/or (2) St. Paul doesn’t much like pedestrians. Environments like this, all over America, help produce the sedentary lifestyles that contribute to the nationwide epidemic of obesity. And it’s also the kind of thing you barely notice unless you attempt the journey on foot. Elsewhere on the Network today: Elly Blue explores one of the least-obvious and most costly aspects of car ownership: depreciation. Bike Delaware notes that “inattentional blindness” — the inability to notice things we don’t expect to see — helps explain why biking is safer when more cyclists are on the streets. And the Missouri Bike Federation encourages readers to take action against the proposed “South County Connector” highway project in St. Louis. Mapping Accessibility: What Can You Get to in 20 Minutes? Sometimes, high-quality transit is within a walkable distance, but people just aren't used to walking to the train. New signage in St. Paul, Minnesota, funded through a local challenge from a national foundation, aims to help people get over that mental block and walking to the nearest Green Line station.